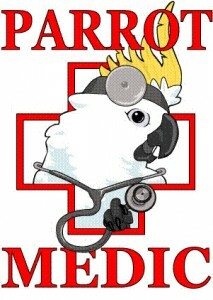 If you haven’t picked up your ParrotMedics kit as of yet, visit the Emerald Feather booth and pick one up! All of the proceeds from new ParrotMedics kits will continue to support psittacine disease research (which includes PDD) at the Ontario Veterinary College. It consists of veterinary quality supplies and a first aid booklet written by Dr. Michael Taylor, Dr. Dale Smith, Dr. Erin Harrison and Geri Higginson from the Avian and Exotics Service. Posted in CPC09vendors, CPC10vendors, cpc11vendors, cpc15vendors.